Pages are either printed in “signature format” and sewn or printed as sheets, stacked, milled and glued (and sewn on top of gluing if requested). Both are then reinforced by a cloth with industrial glue along the spine. The hardcover is made of firm solid cardboard where a linen (cloth) or leatherette wrap is glued to the boards. The book block’s end sheets are then mated to a hardcover with industrial glue, and the whole assembly is inserted into a press. 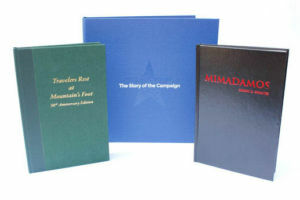 Case binding is common among many genres of books and often used when a more elegant finish to the book is desired with increased durability. 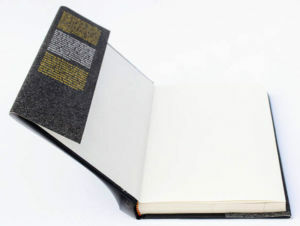 Case bound (hardcover) books are considered the “luxury” tier of book binding and come at a premium over perfect binding. Case bound books also have options for additional appearance enhancing features such as head bands, bookmark ribbons, embossing, foil stamping, and die cutting. 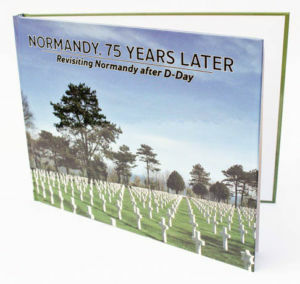 A dust jacket is often used with hardcover books as additional protection to the hardcovers decorative finishes. We can print your book in any standard size (5.5 x 8.5”, 6 x 9”, 8.5 x 11”, or 12 x 12”) or custom sizes. 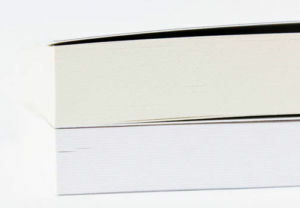 Not sure what size your book should be? We can show you a variety of samples to help you decide what size will best work for your manuscript. We can print your book in black/white, color, or a combination of the two. Color is an option that can enhance the look of your book. A popular choice is to print the pages of the book in black/white and have the cover in color. A custom dust jacket is printed to wrap around the outside of your case bound hardcover book. Dust jackets are available in gloss or matte lamination. BookLogix can custom stamp your case-wrapped hardcover book with a variety of color and metallic foil options. Our papers handle text, graphics, black and white, and color work. We offer matte and glossy options, white and natural papers, and custom papers by request. Our staff will help you to select the right type of paper for your book. If you have photos you’d like to include in the book, we can insert the photos into your manuscript in either black/white, color, or a mix of black/white and color. Photos can be placed in any section of your book. As part of our setup and pre-press process we will send you a finished copy of your book as a sample or “proof” to review. Once we receive your files our pre-press and design team will meticulously review your files. Once they have reviewed and adjusted the files for print we will print, bind, and ship you a finished copy to review (or you can pick up the proof if you live in the Atlanta, GA area). This process has saved many authors time and money by enabling them to carefully go over the book one last time. We keep a copy for ourselves that we use as the standard for your book when it’s time to go to production. Time of the essence? In a hurry? We also offer electronic proofs when time doesn’t permit a physical proof. This way you are still able to review the files before print if we had to make any adjustments during the pre-press process.